WHAT IS THE DIFFERENCE BETWEEN PORTABLE AND IN-GROUND BASKETBALL HOOPS? Whether you are deciding between a portable or in-ground basketball goal, or considering upgrading your portable unit, it’s important to understand the distinctions between the two types of hoops before making a purchase. A portable basketball hoop has a large plastic base with wheels for rolling, but don’t be fooled by the name. While portable goals can be moved to different positions in your driveway, these types of goals often remain stationary through their lifetime because the can be cumbersome to move. Although you won’t frequently move your in-ground hoop, premium in-ground goals are installed with an anchor system allowing you the flexibility to unbolt and relocate the hoop if you move homes. Because portable hoops are weighted by either sand or water inside the plastic base, they do not require in-ground installation. However, they do require anywhere from 90 minutes – 10 hours of assembly out of the box. The installation process for an in-ground basketball hoop requires multiple tools and people to complete. This process generally takes about 4 days including 3 days for concrete installation and curing and 1 day for final assembly of the hoop. However, once the process is complete, the permanency and performance of an in-ground goal can’t be beat. Because the average lifespan of a portable is roughly 1/3 the life of a premium in-ground system, the backboard, pole, and other materials are less substantial, making the hoop less expensive. The higher quality of materials used, the more expensive the goal will be. 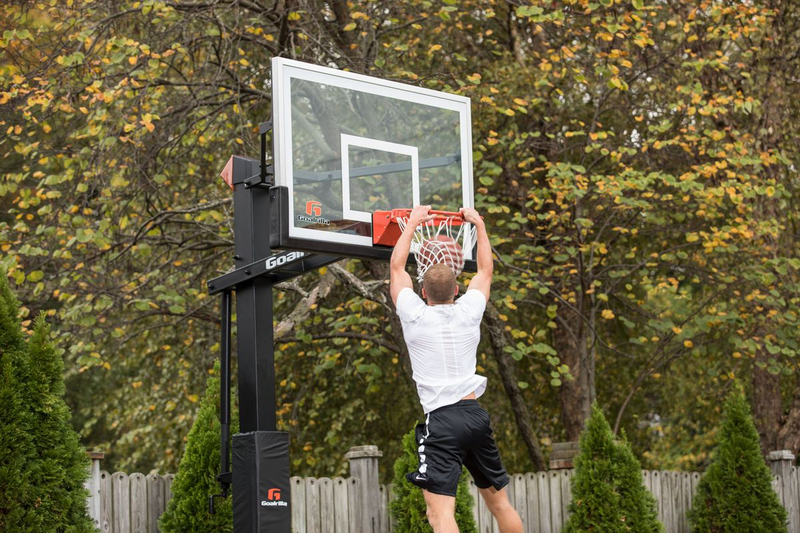 In-ground basketball hoops often use real glass, steel poles and have a lifespan of 5 to 7 years, with many premium goals, like Goalrilla, lasting up to 15 years or longer. A premium hoop mimics pro level performance for superior playability. Unlike in-ground hoops that feature a glass backboard that simulates pro-level performance, a portable hoop is unable to support the weight of a glass backboard. Instead portable goals utilize a lighter, plastic backboard which sacrifices rebound and playability. Because they are made with more economic materials, the average lifespan of a portable system is roughly 2 to 5 years. Most portable hoops utilize a blow-molded base as a support structure, which is typically the first piece that fails. An in-ground basketball hoop closely replicates the performance of NCAA and NBA hoops, offering the most advanced performance of any residential goal. Most in-ground goals feature tempered glass backboards which offer the most authentic rebound available while the solid steel pole mounted in concrete offers incredible stability for the entire unit. Because portable hoops feature a counter-weighted base filled with either water or sand, they cannot endure heavy or rough play, such as dunking, due to the risk of tipping or falling over. The in-ground, concrete installation process makes the hoop much more stable, eliminating the risk of tipping over, especially during a dunk. Additionally, in-ground hoops take up less ground space, reducing the trip hazard of a portable’s molded base. Now you’ve had a chance to see the ins and outs of both in-ground and portable hoops, you probably have a better idea of what you’re looking for. Click on the image to the right to learn in-depth about the factors that matter most for an in-ground hoop. Otherwise, click the image on the left to see our selection of portable hoops. Why should you consider buying a basketball hoop? What safety features do I need to consider when buying a hoop?